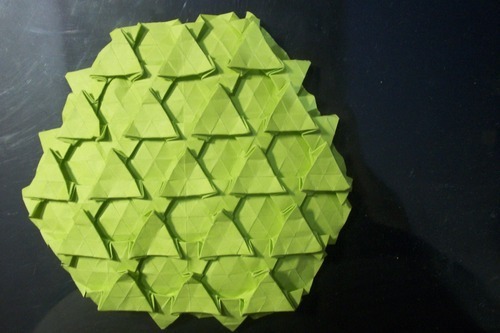 This is designed by Eric Gjerde, and the diagrams can be found in his book “Origami Tessellations.”It is basically composed of rabbit-ear triangle sink folds arranged in a way to make it look like stacked triangles. It is a bit hard, but things will go smoothly when the precreasings are done right. The back also looks great. 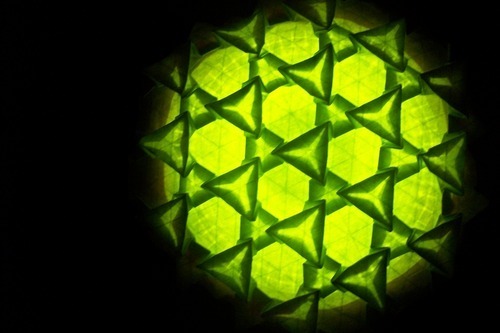 Just imagine of interlocking hexagons since I do not have a picture of the posterior side. If I were to give a rating from 1-10, 10 being the hardest, I would rate it a 6.5.